Hey, marketers! Do you ignore your organization’s most important audience? Probably, says consultant and author Carla Johnson. Chances are, you and your team put all your brand-building energy into external messages. But who are any company’s biggest brand builders? Who, in fact, turn (or don’t turn) your marketing promises into truth? The people on the inside. If your co-workers aren’t part of your content marketing strategy, you’re missing an opportunity. Make “who we are” clear and simple. Create employee content that inspires. Decide how you want employees to feel about your brand. All quotations and images in this post come from Carla’s presentation. Many employees have no sense of their company’s brand identity. Carla cites a 2012 Gallup survey which found that 41% of employees don’t know what their company stands for and don’t know what differentiates their own company from its competitors. How can people represent – or fully support – something they don’t understand? “We’re creating a vortex of ignorance” with employees, Carla says. Businesses need to constantly convey “who we are” – clearly and simply. Vision and mission statements alone don’t cut it. It’s ridiculous to think slogans and posters suffice, Carla says. What employees need is an in-their-bones sense of shared identity. Kathy Button Bell, chief marketing officer at Emerson, came up against a challenge with her company’s brand identity. When she came on board, Emerson was “a brand without a brand.” The sub-brands were well established, but employees – over 110,000 people around the world – had no sense of the global Emerson brand. Kathy’s team asked customers how they felt about Emerson. Over and over, people said the same thing: We can bring our toughest problems to Emerson, and your engineers will help us figure it out. Emerson encapsulated its brand in this statement: Consider it Solved™. The marketing team took this sense of identity into every nook and cranny of the organization around the world. Two years ago, when the company celebrated its 125th anniversary, the video it created leaves no doubt that Emerson’s employees know what this company stands for and what makes it special. You couldn’t ask for more enthusiastic ambassadors for a brand. How many employees know what your organization stands for and what sets it apart from its competitors? How could you adjust your content marketing strategy to increase that awareness? Carla estimates that 80% of information given to employees is administrative: “information they have to know and we have to give them” (usually mundane and full of corporate-speak). The rest is something like 10% crisis-related and 10% – if that – creative, fun, unexpected, or inspiring. 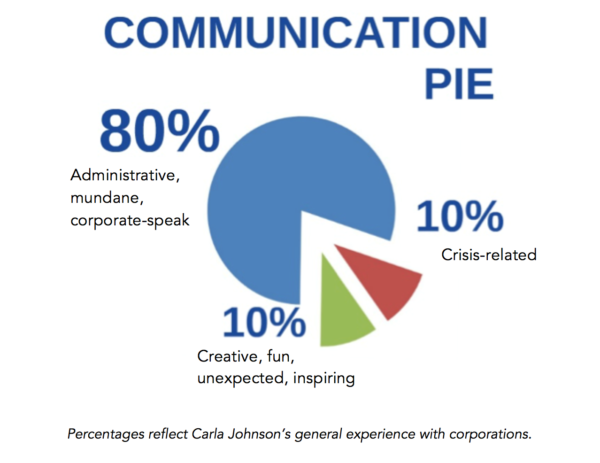 Re-slice that communication pie, Carla says. Under the leadership of CMO Antonio Lucio, Hewlett-Packard focuses “a conscious 60%” of employee communication on the inspiring story of HP. Another company that emphasizes engaging content for and by employees is Molson Coors Brewing Co. When the company’s CEO noticed its beers were not on tap at all the pubs in Denver – the company’s back yard – the marketing team kicked off an internal program: Reclaim Colorado. Each employee was given a $35 monthly allocation for buying beer for others when they were out having drinks. Employees came back and shared stories of what it was like to be an ambassador for the brand. 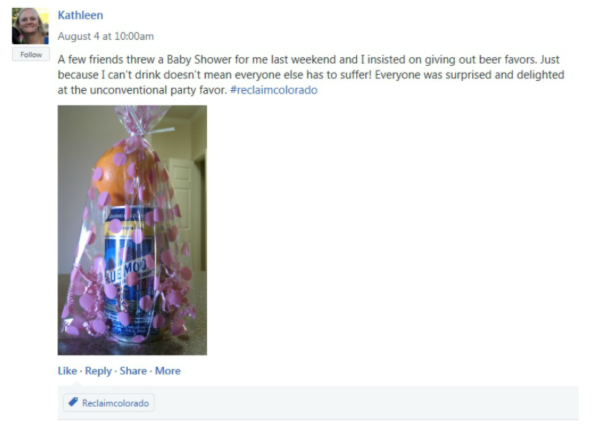 Below is one of over 200 stories shared by employees internally (on Yammer), relaying enthusiastic experiences with the Reclaim Colorado program. In this case, a mom-to-be fills in her co-workers on the unconventional party favors she created for her baby-shower guests. How much of your organization’s content for and by employees do people find inspiring? How could you adjust your content marketing strategy to inspire them more? 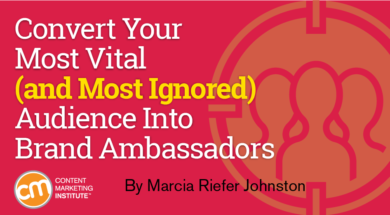 Employees serve as ambassadors for the brand only if they emotionally connect with it. Thus, to create an effective internal content marketing strategy, determine first what the company wants employees to feel about its brand. In other words, Carla says, work backward from the goal. Design your strategy for employee communications the way an architect designs a building: Consider the experience you want to create then design the building – or the strategy – that delivers that experience. Molson Coors wanted its employees to feel pride in the company, so it first shared the company story, and then inspired and empowered them to share that story – over beers – with family, friends, and co-workers. Ford Motor Co. realized the importance of employees’ emotional connection to the company. In the early 1980s, Ford created an internal TV network and broadcast company news around the clock to all 250 of its employee locations. How does your company want employees to feel about its brand? How could you adjust your content strategy to build this emotional connection? However much attention your content team may be investing in communicating with your organization’s most vital audience – its employees – Carla suggests putting more energy into supporting them in becoming smarter, stronger brand ambassadors. How do your company’s content teams help inspire employees? Let us know in a comment. Learn more about how to improve your content marketing program from Carla Johnson and hundreds of experts at Content Marketing World Sept. 5-8 in Cleveland, Ohio. Register today and use code BLOG100 to save $100.